"And if thou say in thine heart, How shall we know the word which the Lord hath not spoken? When a prophet speaketh in the name of the Lord, if the thing follow not, nor come to pass, that is the thing which the Lord hath not spoken, but the prophet hath spoken it presumptuously: thou shalt not be afraid of him." In other words, if a prediction a prophet makes does not come to pass, he is a false prophet. That's pretty straightforward, isn't it? Not some predictions, but every prediction must come just as prophesied. This one just blows all these other guys out of the water! No excuses! Some may say, "But what about Jonah? He prophesied that Nineveh would be destroyed. He was God's prophet, but it never happened. What about that?" Yes, friend, God told Jonah that if Nineveh didn't repent, He would destroy it, but they heeded Jonah's word and they repented, so God didn't destroy it. If a person is God's prophet, that prophecy comes to pass according to the conditions given, period! "And he said, hear now my words: if there be a prophet among you, I the Lord will make myself known unto him in a vision, and will speak unto him in a dream." According to the Bible, a true prophet of God receives his communications from God by two distinct methods: dreams and visions. That's what the Bible says and no further comment should really be necessary. "He hath said, which heard the words of God, which saw the vision of the Almighty, falling into a trance, but having his eyes open...He hath said, which heard the words of God, and knew the knowledge of the most High, which saw the vision of the Almighty, falling into a trance, but having his eyes open:"
Therefore, test number three of these divine manifestations that God gives to identify a true prophet while in vision, is that their eyes remain open. Very interesting, because this perfectly describes what would happen to Ellen White while she was in vision. People in her day would wave their hands in front of her face trying to make her blink. On several occasions men would take their fists and act as if they were going to hit her, then would stop just a couple of inches from her nose! Never once would she blink while in vision. She was oblivious to what was happening around her! "For how can the servant of this my lord talk with this my lord? for as for me, straightway there remained no strength in me, neither is there breath left in me." Another test of a true prophet is that they have no breath while in vision. In other words, they don't breathe. According to scripture, this is one of the miracles God performs to identify a genuine prophet. While in vision, they don't breathe. During some of Ellen White's first visions, people would hold a mirror in front of her mouth to see if there was any condensation on it. Why, one man even came up and put his hand over her nose and mouth to see if she was breathing. In one instance, there was a spiritualist physician in Parkville, Maryland, who bragged, "Ellen White just hypnotizes herself. If she ever 'went into vision' when I was around, I'd snap her out of it. She wouldn't pull that kind of stuff around me." You know, God vindicated His servant, because she went into vision one day when this man was in the room. Now was his chance to "snap her out" of her "mesmerized" state. So he went up to her and began doing the things he believed would bring her out of her hypnotized state. Suddenly, he turned and ran for the door. Just as he got out the side door, the deacon grabbed him by the arm and said, "Where are you going, doctor?" He turned around and in a strangled voice said, "My God! She doesn't breathe!" "Then there came again and touched me one like the appearance of a man, and he strengthened me." Before a vision, a prophet may be very weak in physical strength. But when taken in vision, a true prophet will suddenly receive supernatural strength. On one occasion, Sister White lifted a Bible that weighed approximately 18 pounds, and held it out at arm's length for over 30 minutes! You should know that she was a frail woman who weighed less than 100 pounds. Here's a picture of that 18 pound Bible. That's a regular Bible laying on top of it. Notice the difference. Also, while holding the Bible, Ellen also quoted the scripture on the pages exposed at that moment, without looking at them. I've had that very Bible in my hand. And with veins bulging on my neck, I held it at arm's length for 53 seconds! (My arm was shaking for two minutes after that.) Why, the one-time "strongest man in the world," Mr Universe, held that Bible out at arm's length for four minutes. And friend, let me assure you, all the things I'm telling you today are documented, I'm not just talking off the cuff here. "The prophet which prophesieth of peace, when the word of the prophet shall come to pass, then shall the prophet be known, that the Lord hath truly sent him." A true prophet absolutely does not lie. His predictions will be one hundred percent fulfilled. "Knowing this first, that no prophecy of the scripture is of any private interpretation." So, a true prophet prophesies in the name of the Lord, not in his own name. A true prophet will manifest the fruits of that same spirit because he or she speaks through the inspiration of the Holy Spirit. In other words, a true prophet gives direction to God's true church. And a true prophet's messages will cover all of these three areas: Edification -- to instruct morally; Exhortation -- this means to strongly advise; and Comfort -- to soothe in distress or sorrow, to console. All of these three things will be exemplified by a true prophet. "And when they shall say unto you, Seek unto them that have familiar spirits, and unto wizards that peep, and that mutter: should not a people seek unto their God? for the living to the dead? To the law and to the testimony: if they speak not according to this word, it is because there is no light in them." God gives a clear distinction between false prophets and true prophets here -- between the works of hellish darkness, and the works of heavenly light. How could it be any plainer? God says, "To the law," what's the law? It is the ten commandment law of God, " . . . and to the testimony . . ." What's the testimony? The "testimony" is the rest of scripture. " . . . If they speak not according to this word [the 10 commandments and the Bible], it is because they have no light in them." Friend, that's not what I say, it's what God says. That means a true messenger of God will keep all of God's ten commandments. In other words, a true prophet of God is going to be a seventh-day Sabbath-keeper. Was Ellen White a seventh-day Sabbath-keeper? You better believe she was. God showed her in vision how this commandment was being desecrated, ignored, and forgotten by almost the entire world. And through the prophetic gift of this little lady, God raised up a people who would honor all of His commandments. "Beloved, believe not every spirit, but try the spirits whether they, are of God: because many false prophets are gone out into the world. Hereby know ye the Spirit of God: Every spirit that confesseth that Jesus Christ is come in the flesh is of God: And every spirit that confesseth not that Jesus Christ is come in the flesh is not of God: and this is that spirit of antichrist, whereof ye have heard that it should come; and even now already is in the world." A true prophet believes in the incarnation of Jesus Christ, and will never question the fact that Jesus came in man's fallen nature, in our fallen flesh. The Bible says any person, or church, claiming that Jesus Christ came to this earth in any other way, than in the fallen flesh that you and I have, is the spirit of antichrist. In other words, it's imperative that you and I understand correctly Christ's human nature while on this earth. Ellen White believed and taught the correct biblical definition of Christ's human nature: He came to this earth in our nature, in our fallen, human flesh. But in spite of that, He never yielded to temptation; He was sinless, and you and I can be victorious over all sin in our life through the power, and the blood, and the strength of our Lord, Jesus Christ, our perfect Example. Hebrews 4:15: "For we have not an high priest which cannot be touched with the feeling of our infirmities [not Adam's - the infirmities before he fell - he didn't have any - our infirmities]; but was in all points tempted like as we are, yet without sin." Don't you see, Jesus' perfect life on this earth was an example for us to follow. 1 Peter 2:21, "For even hereunto were ye called: because Christ also suffered for us, leaving us an example, that ye [we] should follow his steps." This test, Number 11 plainly states that God's true messengers on this earth will be teaching victory over sin, and that Jesus' perfect life is not our substitute, but our example! Very important: Christ was our substitute only on Calvary. His perfect life is our example! Through the power and strength of Jesus Christ, can we stop sinning? Yes! Jude 24: "Unto him that is able to keep you from falling, and to present you faultless before the presence of his glory with exceeding joy." There is not one sin in our life that Jesus cannot give us victory over, if we will just let Him do so. 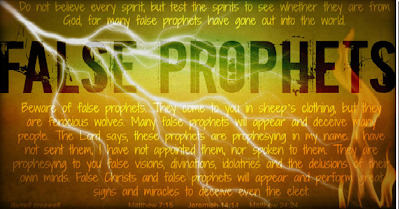 "Beware of false prophets, which come to you in sheep's clothing, but inwardly they are ravening wolves. Ye shall know them by their fruits. . ."
In other words, look at what their ministry produces. If all they produce is a good time, with theme parks and water slides, and all they spend their time doing, is telling people to send them money, on the authority of the Word of God, that person is a false prophet. Answer one question: why do all these false prophets today, insist you send them your money? If they're truly of God, they should be happy for it going anywhere in God's work. But no, they tell you that you must send it to them before God will bless you. Well, "by their fruits ye shall know them" (Matthew 7:20). This is exactly what God showed Ellen White about false prophets in the last days. Look at the fruits of a ministry, look at the fruits of a messenger. Are they preaching the truth, or lining their own pockets? Very important! Now friend, we just looked at the twelve biblical tests of a true prophet. You can examine the Bible from Genesis to Revelation, and you can apply these twelve tests to any person who has ever lived since the time of John the Revelator, which was around 100 A.D. You can take these twelve tests of Scripture and line them up with anyone who has lived in the past 1800 years. As far as I know, they will only match up with one person that we know of-- a little woman who lived from 1827 to 1915 by the name of Ellen G. White.